Want more UAP news? Subscribe to our email list! The University of Akron Press will be at the 2019 AWP bookfair in Portland, Oregon from March 27 to 30. 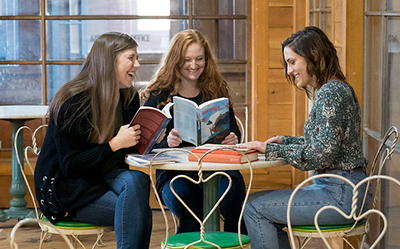 The AWP bookfair is America's largest showcase and marketplace for independent literary presses and journals, creative writing programs, and literary arts organizations. We'll be at table T5054, on a corner one block west of "Bookfair Boulevard," the main drag through the convention center. Stop by to meet the Press, pick up your 2019 UAP button, and buy some books. For 2019 The University of Akron Press brings five new poetry books to AWP. We have three new collections -- Brittany Cavallaro's Unhistorical, Krystal Languell's Quite Apart, and Tyler Mills' Hawk Parable -- plus a new edition of Caryl Pagel's Twice Told. We're also proud to offer Jennifer Phelps and Elizabeth Robinson's collection of essays on spirituality and innovation in contemporary women's poetry, Quo Anima. All of these books -- and many more -- will be available with special AWP pricing. Our books are also available to order at our website, where you can use the code AWP30 for a 30% discount. Authors will be available to sign their new books at AWP, too. At our table, meet Krystal Languell on Friday from 1 to 2 p.m.; Brittany Cavallaro on Friday from 2 to 3 p.m.; and Jennifer Phelps and Elizabeth Robinson on Saturday from 10 to 11 a.m.
One great feature of the annual AWP conference is all the opportunities we have to see and hear writers reading from their work. The University of Akron Press, with Noctuary Press, will host a reading from 4 to 5 p.m. at Taborspace, 5441 SE Belmont Street, Portland, Oregon 97216. Brittany Cavallaro, Krystal Languell, and Tyler Mills will join Noctuary writers Denise Duhamel and Julie Marie Wade. On April 15, submissions open for the 2019 Akron Poetry Prize. Our judge this year is Victoria Chang, whose fourth book of poetry, Barbie Chang, was published by Copper Canyon Press in 2017. The winning poet receives $1,500 and publication of his, her, or their book. For more information, visit the Akron Poetry Prize website. Consider giving a gift today to support The University of Akron Press! Donate online now. Hello and welcome to our new monthly newsletter from The University of Akron Press. Each month we'll send news of our books and events. We'll also send coupons. You are probably receiving this email because you have supported The University of Akron Press in some way in the past--perhaps you bought one of our books or signed up for mailings at one of our tables or sales. Either way, thank you for supporting The University of Akron Press. And if you are one of our authors, current or prospective, please keep writing your next book. And please keep us in mind when it comes time to seek a publisher. A Brief History of Fruit by Kimberly Quiogue Andrews won the 2018 Akron Poetry Prize, chosen by Diane Seuss, this year’s judge. In this book, Andrews’s full-length debut, we move between the United States and the Philippines in the search for a sense of geographical and racial belonging. Driven by a restless need to interrogate the familial, environmental, and political forces that shape the self, these poems are both sensual and cerebral: full of “the beautiful science,” as she puts it, of “naming: trees of one thing, then another, then yet another.” Colonization, class dynamics, an abiding loneliness, and a place’s titular fruit—tiny Filipino limes, the frozen berries of rural America—all serve as focal markers in a book that insists that we hold life’s whole fragrant pollination in our hands and look directly at it, bruises and all. Browse previous winners of the Akron Poetry Prize on our website, including our 2016 editor’s choice and the 2017 National Book Award Finalist, Leslie Harrison's The Book of Endings. 30th Anniversary Sale: 30% off all books! The University of Akron Press is 30 years old! Founded in 1988 by The University of Akron Board of Trustees, the Press was first directed by Dr. Daniel Nelson of the History department, with invaluable assistance from Mary Beth Mersky, an employee in the Provost's Office. In the early years, the Press had no physical office but lived, as Mary Beth used to say, "in a box under her desk in the Provost's Office." Initial funding for the Press was provided by Paul Martin (Class of '35) and our first book was George Knepper's Summit's Glory: Sketches of Buchtel College and The University of Akron (1990). For many years, copies were given to every graduate at each commencement ceremony. In thirty years, the Press has published more than two hundred books. Help us celebrate our thirtieth anniversary by using the coupon code UAP30 for 30% off all titles ordered through our website before midnight on Thanksgiving Day, November 22, 2018. Photo credits in order of appearance: Miriam Bennett, Rachel Engel, and Miriam Bennett.